Save on interruptions with asynchronous communication. 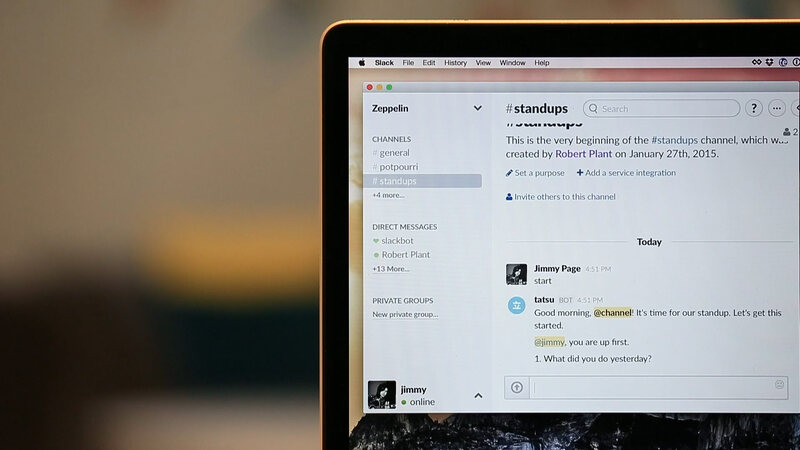 Tatsu, meaning "to stand", is a Slack app to help your team do asynchronous, remote standup meetings. ‘start’ will start a meeting for that day. Tatsu will notify the channel that the meeting is starting and it will call on the first participant. ‘skip’ will skip the current participant and move on. Once the rotation is complete, it will return to any skipped participants. ‘dismiss’ will skip a participant for the day. Useful for people who are on vacation or otherwise not in the "office". ‘quit’ will prematurely end the standup for the day. This will notify the channel that the standup has ended and cease asking questions. Typing start will start a meeting for that day. Tatsu will notify the channel that the meeting is starting and it will call on the first participant. Typing skip will skip the current participant and move on. Once the rotation is complete, it will return to any skipped participants. Typing edit #n, where n is the question number, will allow you to change the answer to the specified question. Typing ready will immediately allow you to answer Tatsu for the day, given no one else is currently answering. Typing dismiss will skip a participant for the day. This is useful for people who are on vacation or otherwise not in the "office". Typing quit will prematurely end the standup for the day. This will notify the channel that the standup has ended and cease asking questions. Typing resume will continue the day's standup if it was stopped with the 'quit' command. This is useful if you need to finish a standup that was quit prematurely. Typing delete will provide the link to follow to delete today's standup. This is useful if you were forced to quit today's standup, and would like to start it over from scratch. Typing status will display the current state of the standup. This is useful if you've lost track of the progress of the meeting. Typing help will display all available commands that Tatsu can respond to. You can request help at any time. Easily stay aligned with your team.